Have I mentioned you are all the best? I really want to thank everyone for their support as I grow my little blog here. I promised more loot in the give-away....so here you go! There are a lot of sticker sheets here. Just about everything you can imagine. I counted about 32 individual sheets. 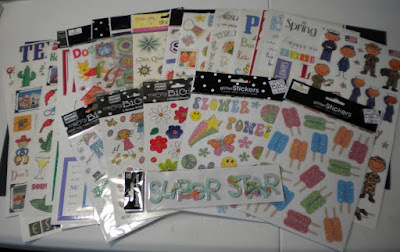 Some are the long sheets, some are smaller and in packages of 3, some are glittery, puffy and chipboard. Actually, I think I want this! But then again, who wouldn't? It's a lot of fun and hours and hours of sticker-tastic adventures. So...what's the catch? How do you get a chance to win this pile of sticky fun along with the adorable rubber stamps, not to mention that brand new cricut cartridge? Follow the give-away link at the upper right corner of this page....and follow the directions. You have up to 5 chances to win. It's free...it's fun...and anyone can play. Anyone...anywhere. Spread the news. Totally cool giveaway, never can have to many stickers. Great give away. Good luck to everyone. Another great giveaway! Like the giveaway from before.. I posted everything on my Facebook & blog, with the Give Away Icon. :) Thanks! And congrats to whom ever wins!